Buy Spiritual Energized Items Online, What are Spirituality, Chakra Healing and Religion? Understand the Difference. Amid the rising level of incomes as well as inner discontentment, the people especially from West have turned to India for sensing a touch of spirituality. When it comes to a philosophy concerning life in general, the idea of spirituality takes precedence over religion or the sectarian dogmas concerning religion. When it comes to a religion, it is mostly related dogmas, principles and commandments that the follower (of that religion) must follow in order to maintain its sanctity. The idea of religion is connected with a set of moral instructions given by the Higher power (God). The follower is governed by their commitment to obeying the religious codes of conduct in order to be respectful toward other things, people and God. The moral instructions are generally there to stop oneself from going off the righteous path. It is believed by the religious leaders that disobedience to the laws (Word of God) attract punishment (correction) either by the community or Higher power (Supreme) after death. Fear of this punishment keeps the follower stuck to the religion. Spirituality on the other side is a broader idea or concept. Spirituality has become a subject of interest for many thinkers especially those from West because it solely hinges on attaining self-realization rather than preaching the sectarian dogmas. Being spiritual can be said to be inquisitive about the natural functions of the Universe or curious to view the things as they are. One’s spiritual strength determines their tendency to view things as they are. It is the inner path that the person follows in their search of their true nature, to discover their real Self. Spirituality means different things to different people. For some, spirituality is the equivalent of spiritual power, for others it may mean material things that help in sadhana such as spiritual malas and puja idols, whereas for others, spiritual puja and worship for fulfillment of a purpose. Everyone’s approach in this sphere is different. Some people use meditation products, malas and spiritual mantras and music. For others, it is a private affair and they deepen their sadhana through spiritual therapy, mantra or Rudraksha. One may say that a set of religious or moral codes is required for those who find it hard to control their senses, thoughts or un-controlled behavior or who are susceptible to the tendency to go off the righteous or religious path. Spirituality may be said to be there for the inquisitive person who tends to see through all the religious philosophies a bigger picture. Liberty is central to spirituality. One who is liberal in terms of thoughts and behavior finds it easier to cultivate and practice spirituality. When it comes to spirituality, there are different ways to attain it. There are no fixed ways as religious instructions in case of religion to attain the goal. Freedom in the execution of a spiritual practice is as much important as the spirituality itself. The above verse encourages the person to observe things around them as they are and should raise themselves above the tendency to think about material objects of insignificant values because spirituality soars higher than religion. The first line of the verse ātmano gurur ātmaiva is very important. It says the person himself (ātmano) can act has his own instructor (gurur). It means being spiritual is above the obedience to the set of religious instructions that are there for those who are unable to see things as they are. Therefore, to be spiritual one must observe people, things and nature around them. One must cultivate a philosophy or a vision of seeing things as they are. Mediation: This is one of the most esoteric yet popular ways of developing a spiritual sense. There are many types of mediation. Meditation aims at calming down the fickle mind. It is one of the best ways to still your mind and increase spirituality. The strains and stress of modern life are reason enough for anyone to feel a need for being spiritual. The busier you get and the less time you have to spare, the more you need to practice stilling your mind. This is because the pressures you are facing and the responsibilities you carry out bring fresh challenges in your life. And meditation will not only release you from tension and strain, it will refresh your mind and improve your ability to face whatever life throws at you. There are various types of mediation that you can choose from. Following are some of the known methods. Sound Meditation: It is a mantra-based meditation where the sound of mantra helps you go into deeper stages of awareness by releasing you from the clutches of your brain. There are several mantras offered by Vedic texts and the most popular is the OM mantra. By reciting the OM mantra, one can focus on the sound of OM and feel the mind sliding into a complete state of calmness. Zen Mediation: A gift from Buddhism, it is based on the philosophy rather than religion. The practitioner gains awareness through observing the breath and the mind and communication with the teacher. Zen meditation stresses on the achievement of enlightenment and the individual expression of spiritual vision in the Buddhist teachings. The Zen sutras (scriptures) are taught through communication with a practiced and proficient teacher. Transcendental Meditation (TM): This technique uses a mantra or Sanskrit words to help focus instead just following the breath. The guru (teacher) gives the mantra to the students depending on their age, gender and mental makeup. This meditation was founded, practiced and given by Maharishi Mahesh Yogi. Reflective Meditation: This analytical meditation is focused on logical thinking to meditate on an object, a question, a wish or anything that impacts you emotionally. While doing this meditation, the practitioner can ask: Who am I? What is the actual purpose of my life? Why am I suffering from this? Why can I not do this? What is my role in this universe? One needs to sit in a relaxed pose and effortlessly reflect on the object or the above questions. At first, your mind may not be able to focus because of its flitting nature, but gradually it becomes used to this technique. The meditator easily finds cues to solve the problems. Studies show that self-reflection practiced in an undisturbed place can help minimise angst, stress and depression, while enhancing optimism, creativity, and liveliness. Mindfulness-based Stress Reduction Started by Jon Kabat-Zinn in 1979, this technique uses breath awareness and body scan. Breath awareness is as simple as it sounds. You focus your attention on the inhalation and exhalation. Body scan is a process of focused attention on the physical body, starting at the toes and working your way up with heightened awareness with the potential for release or relaxation of tension. The practitioner may be seated, laying down, or walking depending on the focus of practice. This is a popular technique taught worldwide to health care professionals to create a partnership between the patient and the medical team. Kundalini Yoga: The Kundalini Yoga tradition prescribes specific and practical tools that carefully support the mind and guide the body through the use of breath, mantra, mudra (hand positions), and focus geared towards the awakening of the Kundalini. The range and variety of meditation techniques in the Kundalini Yoga tradition is very large and includes haṭha yoga techniques (such as bandha, pranayama, asana), Patanjali’s Kriya yoga (consisting of self-discipline, self-study, and devotion to God), tantric visualisation and techniques of laya yoga. Read more about how these chakras work, knowing which will help you cultivate spirituality. This is a powerful pendant of 1 mukhi and 9 mukhi representing the Cosmic Union of Shiva and Durga. This is the most powerful combination for meditators which opens up their higher consciousness and aligns them with the Supreme atman. It is best for Meditation, Spiritual growth, Contentment, Success and peace. represents the Divine Mother. She is the energy aspect and soul of the Lord. Without Durga, Shiva has no expression and without Shiva, Durga has no existence. It is beatific Union of these divine energies from which the whole manifests. Eka mukhi Rudraksha bead is the rarest amongst all mukhis. Regarded as the king of all Rudraksha beads, One Mukhi Rudraksha bead is ruled by Rudra (Shiva) Himself. •	The most powerful One Mukhi Rudraksha bead comes from Java/Indonesia. •	It symbolizes the link between earth and heaven, individual consciousness and the ultimate consciousness, between man and God. •	It represents shiva-tattva, the purest element of creation emanating from Shiva. One Mukhi Rudraksha bead also re-energizes your topmost Crown Chakra that is ruled by Lord Shiva Himself. Since it is connected with the Crown Chakra, it heals all of your emotional issues. Nine mukhi Rudraksha represents Goddess Durga, who took nine births on Earth to save and protect her followers from devils. So Nine mukhi Rudraksha is auspicious as it has blessings of all nine Goddesses. This is most supportive Rudraksha for women as it acts as protection shield. The wearer is blessed with lots of energy, powers, dynamism and fearlessness, which are necessary to live a successful life. Nine mukhi Rudraksha gives Bhogha (worldly comforts & desire fulfilment) and Moksha (liberation). •	It improves confidence level and gives a stress free attitude to wearer. •	It resolves any nervous disorder, psychiatric disorders and psychological imbalances like fear, phobia, OCD, Hallucinations and worries. 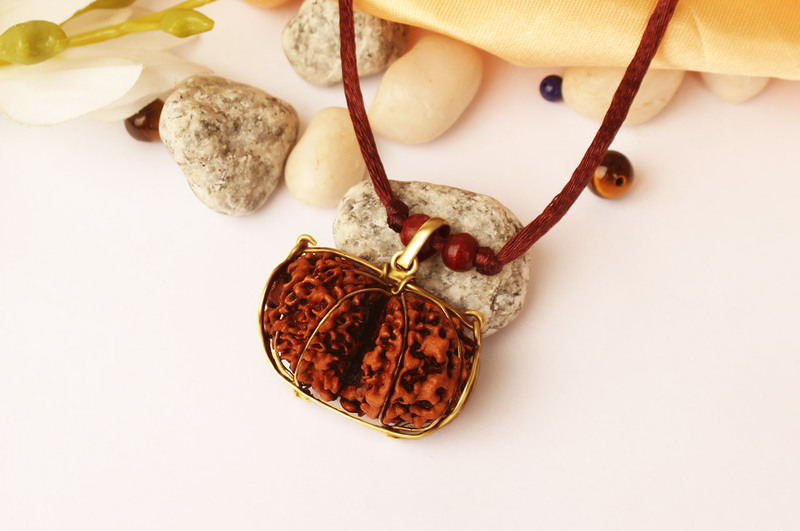 •	According to ancient scripture there are nine types of powers in nine mukhi Rudraksh. It protects the wearer from untimely death and removes the fear of time from mind. •	Nine mukhi helps to treat karma related disorders, idiopathic diseases and even difficult to cure disease. •	Wearing nine mukhi Rudraksha removes blockages in Sahasrara chakra (Crown chakra). •	This chakra stands for wisdom and being at one with the world. •	If this chakra is blocked one may feel frustrated & irritated. It also causes problems in central nervous system and memory. On a materialistic level wearer attracts immense abundance while keeping his focus on spiritual path. •	Heals brain related disorders. •	Brings relief in migraines, epilepsy, nervous disorders. Durga Devi, an empowered goddess boldly declares Her energies and powers as described in the Devi Sukta. She says: “I make the man I love exceeding mighty, make him nourished, a sage, and one who knows Brahman. I bend the bow for Rudra [Shiva], that his arrow may strike, and slay the hater of devotion.” Here ‘the man’ means a human being, neutral gender because She appreciates anyone who is ‘sthira’ (sane) and gentle. She says she makes the person, who she loves, mightier and feeds him as well as preserves his devotional strengths. Also She appreciates the one who knows Brahman. ‘Brahman’ means the transcendence of the Lord and His divine nature. A person who has developed gentle qualities and love for all the fellow beings is the highest of all that is her opinion. One may ask that it is impossible to be gentle all the time especially when there are cheaters around. To answer this, Bhagvad Gita mentions that a person of the sane mind is always under the divine protection. Even if there are trying circumstances, the sane mind is not disturbed. This divine protection is Durga Herself. Mantra: Om Hreem Hoom Namah. After wearing the kantha, chant this mantra regularly for better results. It is the most unique Rudraksha bead in the world. Gauri Shankar rudraksha is the Unified form of Shiva & Shakti represented by two naturally joined Rudraksha. It opens up the Hrit Padma chakra and attracts peace, harmony and abundance in the wearer's life. Hrit Padma chakra is the spiritual heart which is the abode of Goddess Mahalaxmi. It is variously described as a lotus with 8, 16, or 1000 petals, being golden, red, or white of colour; inside of the lotus there are circular regions of sun, moon, and fire and in the centre of the Chakra, there are a whishing-tree (kalpavriksha), a throne consisting of Matrika letters (symbolizing the spiritual heart of the aspirant) on which he/she should place his or her Ishtadevata in meditation, and an altar. •	Gauri Shankar which is the Unison of Male (Yang) SHiva and female (Ying) Shakti is the most powerful Rudraksha for spiritual wholeness. •	According to ancient philosophy, the entire universe is a manifestation of pure consciousness. In manifesting the universe, this pure consciousness seems to become divided into two poles or aspects, neither of which can exist without the other. One aspect retains a static quality and remains identified with unmanifest consciousness. •	In Tantra this quality is called Shiva, and is conceptualized as masculine the other part of this polarity is a dynamic, energetic, or creative aspect that is called Shakti, the great mother of the universe, for it is from her that all is born. •	It is in the heart center that the union of the female and male (Yin/Yang) energies takes place. In other words, when the two opposite and complementary energies within each one of us occurs, then Cosmic Consciousness awakens in the ego of a seeker the bud becomes a rose and unfolds the quality of unconditional love in his/her mystical heart. Mantra: Om Shree Gaurishankaraya Namah. After wearing it, chant this mantra for positive energies. : If there’s anything sacred and sublimely spiritual, it is the Durga Power Bracelet. It is made of 9 mukhi rudraksha is ruled by Shakti, the divine feminine power. Wearer is blessed with energy, powers, dynamism, fearlessness and abundance. Whenever demonic forces arise aiming to disrupt the functioning of Cosmos, the Supreme Lord through His inconceivable energies checks such forces at once. Goddess Durga is one of the female energies of the Supreme Absolute who is known as Devi, Shakti, being the unconquerable force. She is considered as the purest root cause of creation, maintenance and destruction. •	The origin of this divine female energy (Durga) is mentioned in the Shiva Purana. Before the cosmic creations, Shiva invoked Her from His left Half and created Shivloka with Her help. •	It further states the demonic son of Rambha named Mahishasura once created havoc on Bhuloka (earth) and defeated all the gods of heaven, endangering their existence. After hearing such events, Lord Vishnu discharged a huge mass of light from His mouth that merged into the similar rays emitted from the mouths of those gods. •	This powerful light morphed into a powerful female deity called Durga who challenged Mahishasura for a battle. Mahishasura's entire army packed with evil-minded soldiers such as Chikshur, Chamar, Asiloma, Vidalaksha, Durdhara, Mahahanu and others assaulted Durga at once. Armed with the celestial weapons, Goddess Durga took on all of them with her matchless brutality and beheaded Mahishasura who tried to kill her in various animal forms. Durga is honored with devotion during the festival of Durga Puja in her ten divine forms kushmanda, chandraghanta, brahmacharini, shailaputri, skandamata, katyayani, kalaratri, mahagauri, Mahakali and Durga). •	Alleviates depression and Cures dizziness. This is an outstanding yantra of great values. The use and upasana of Shiva yantra is the worship of Lord Mahamritunjay Shiva and is most auspicious and bestows the person with health and happiness, good fortune and fame. Shiva is represented as destroyer only to create. He is the God of Love, music and beauty. His Grace is boundless. He is the Saviour and Guru. He is Satyam, Sivam, Subham, Sundaram, Kantam. He is the Supreme Light that shines in your heart. He is Param Yogi. His worship opens the conciousness in you to realise God within . He is the protector and saviour. This Yantra is etched with Mahamantra of Lord Shiva which is Om Namah Shivaya. •	Yantra energizes the location where it is installed. •	You may place it near the entrance of your home/office/shop or in your living room or reception or study room or office cabin. •	You may keep it on a table or use as a wall hanging. Yantra may be placed facing North or East direction. For meditation purposes, it is best to Install the Yantra in the North East direction of your dwelling. North-East is also called Eshaan corner and is recognized as the place of God. This direction is seen as highly charged place as it is the confluence of energies coming from the North magnetic pole and sun rays from East. •	The Yantra placed here gets charged with divine vibrations from universe and provides positive transformation energy/energies to the dwelling through its mystical geometry. Magnificently designed in pure copper with gold finish, the rare and exclusive Siddh Meru Shree Yantra comes in elevated 3d pattern. The highly revered Yantra carries the divine energies of all Gods and Goddesses who bestow good fortune, abundance, wealth, success, popularity and Spiritual wealth. 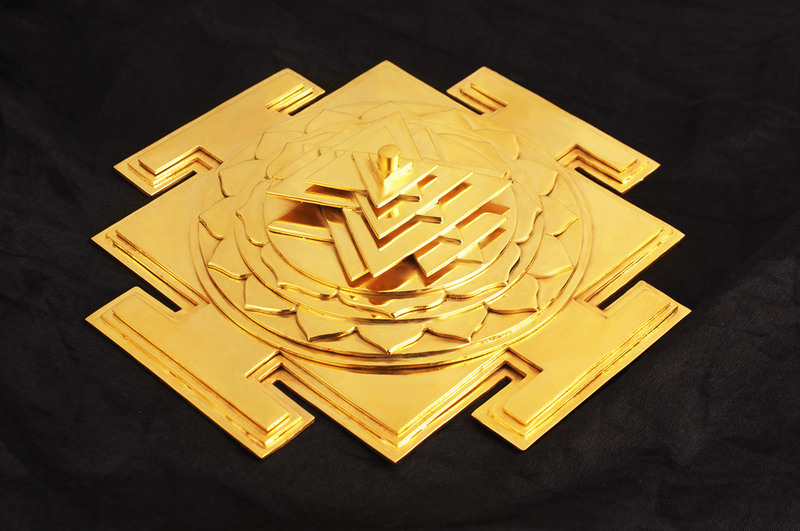 Yantra provides a focal point for the convergence of the individual soul with the specific deity or creative energy. Siddh Meru Shree Yantra is designed as per authentic texts with accurate geometry and steps leading to the merger of the soul with Goddess Lalita, the deity of the Yantra Place the Yantra in your altar or living room or work desk for the Divine grace of divine Mother. It is worshipped by focusing on the Centre of the Yantra by chanting Shodakshari mantra. The Yantra carrying essence of all traditions helps remove all Vastu defects, negativity and malefic planetary influences. It also ensures continuous flow of prosperity, harmony, ordinance and wellbeing of the dwellers. Worship of Shree yantra leads the Sadhak to his true life purpose in life. Siddh Meru Shree Yantra is blessed and energized before sending to you. •	Yantra energizes the location where it is installed. You may place it near the entrance of your home/office/shop or in your living room or reception or study room or office cabin. •	You may keep it on a table or use as a wall hanging. Yantra may be placed facing North or East direction. •	For meditation purposes, it is best to install the Yantra in the North East direction of your dwelling. North-East is also called Eshaan corner and is recognized as the place of God. This direction is seen as highly charged place as it is the confluence of energies coming from the North magnetic pole and sun rays from East. The Maha Meru, or Sri Meru Chakra, is a three-dimensional projection of the great yantra known as Sri Chakra, said to be the Mother of all Mandalas. The sublime geometry of the Sri Chakra is revealed wisdom. It is not of human origin. It is nothing less than the genetic code of the Cosmos. Sri Chakra is said to contain within itself the essence of all other yantras, and thus it contains the essence of all traditions. Certain powers, for example, are ascribed to the six-pointed Star of David, the Christian cross, the five-pointed star, the Egyptian and Meso-American pyramids, and so on. •	The Meru's particular configuration is revered in all Eastern traditions: It integrates the essence of Indian Mother Goddess worship, Mahayana Buddhism, Chinese feng shui, the Eleusinian mysteries of the Ancient Greeks, and so much more. •	The Maha Meru can bring unbounded happiness and every good thing in life. •	Just keeping it in one's home will confer great blessings, because the Meru subtly connects itself to the other major yantras in the world. •	To protect against unfavorable planetary influences; and to bring about healing, prosperity and peace of mind. Wherever it is placed, it brings order, peace, happiness, health, and wealth - in short, everything that is needed. Various scriptures -such as the Shakti Upanishads, the Brahmanda Purana, the Sri Chakra Samhita, the Sri Chakra Yoga Sara, the Sri Chakrartha Sara and others -all state in a single voice that merely seeing the Sri Chakra washes away all sins and grants auspiciousness. A mere touch burns away sin like a wad of cotton wool consumed by a fire.There remains no desire unfulfilled; one experiences infinite enjoyment, both here and in the hereafter. There is no siddhi that cannot be attained by regular worship of a Meru. •	You may place it near the entrance of your home/office/shop or in your living room or reception or study room or office cabin. You may keep it on a table or use as a wall hanging. •	Yantra may be placed facing North or East direction. Shreeyantra raised on tortoise back is especially significant as Tortoise is Kurma Avatara of Mahavishnu which, manifested during the churning of the Ocean from which Mahalaxmi appeared. Quartz is a natural gemstone and has power to retain the energy of mantra chanting. Deity idols are most popularly made using Quartz. Crystals harmonize the aura around us and removes the negative energy. Read about properties & placement instructions. Katyayani yantra is for couples who already love each other but are facing difficulties in being together such as parents' disapproval, interference by others, and interference by those trying to keep them apart, not being able to get married to be together and other obstacles. A male can use this mantra for a girl and vice versa for success in love with auspiciousness and fruitful marriage. Rudra means Shiva; he is the destroyer of all evil. Lord Shiva is the Supreme Lord; He is the provider of worldly desires, inner peace and fulfillment. For devotees, Lord Shiva is the one who provides grace, wealth, power, health and happiness. Lord Shiva has the key to Kubers wealth; its Lord Shiva that has control over all the nine planets. Shri Rudram is the oldest listing of various names of Lord Shiva. Through the chanting of Sri Rudram, Lord Shivas various attributes and aspects are invoked and worshipped. By the power of Shri Rudram sick become well, the unmarried find ideal mates, debts are removed, wealth & power is showered and death is evaded. Eleven recitations of the Sri Rudram followed by one recitation of the Chamakam are called Ekadasa Rudram. This also constitutes one unit of the Rudra Homam. The Vedic hymn that extols Lord Rudra is called the Rudra Prashna. Rudra Prashna is also called the Rudradhyaya, the Shatharudriyam or Sri Rudram. This Sri Rudram is found in the mid portion of the Taittiriya Krishna Yajur Veda. Sri Rudram depicts Lord Shivas Cosmic form. Sri Rudram is also called the Namakam. Namakam literally means the hymn which is made of Namaha. Namaha in Sanskrit has two meanings. One is Salutations and the other is Not mine. Every time when you utter the word Namaha, actually the patterns and karmas get detached from you and get rid of the spell of patterns and karmas. It is said that chanting of Sri Rudram is a direct way to Enlightenment. Kalash Sthapana, Panchang Sthapana(Gauri Ganesh, Punyavachan, Shodash Matrika, Navgraha, Sarvotabhadra), 64 yogini Pujan, Shetrapal Pujan, Swasti Vachan, Sankalpa, Ganesh Pujan and Abhishek, Navgraha Pujan and 108 chants of each planetary mantra, Invocation of major Gods and Goddesses in Kalash, Shivalinga Pujan and Abhishek, Shiva Invocation Mantras, Rudram Namakam Chamakam, Homa with Rudra Ahutiya, Aarti and Pushpaanjali. This is for anyone who seeks to have Bhoga (fulfillment of materialistic desires) and Moksha (spiritual liberation). The worship of Dasmahavidya provides bhoga (fulfillment of materialistic desires) and moksha (spiritual liberation). The Ten Mahavidyas are known as Wisdom Goddesses. The spectrum of these ten Goddesses covers the whole range of feminine divinity, encompassing horrific Goddess's at one end, to the ravishingly beautiful at the other. Mahavidya means (Maha - great; vidya - knowledge) Goddesses of great knowledge. These Goddesses are: Mahavidyas - The ten forms of Shakti. Once when an incensed Shiva threatened to walk out on Parvati. After no amount of coaxing or cajoling by Maa Parvati helped. Maa Parvati multiplied herself into ten different forms for each of the ten directions. Thus however hard Shiva might try to escape from his beloved Parvati, he would find her standing as a guardian, guarding all escape routes. Each of the Devi's manifested forms made Shiva realize essential truths, made him aware of the eternal nature of their mutual love and most significantly established for always in the cannons of Indian thought the Goddess's superiority over her male counterpart. Not that Shiva in any way felt belittled by this awareness, only spiritually awakened. This is true as much for this Great Lord as for us ordinary mortals. Befittingly thus they are referred to as the Great Goddess's of Wisdom, known in Sanskrit as the Mahavidyas. Indeed in the process of spiritual learning the Goddess is the muse who guides and inspires us. She is the high priestess who unfolds the inner truths. Kalash Sthapana, Panchang Sthapana(Gauri Ganesh, Punyavachan, Shodash Matrika, Navgraha, Sarvotabhadra), 64 yogini Pujan, Shetrapal Pujan, Swasti Vachan, Sankalpa, Ganesh Pujan and Abhishek, Navgraha Pujan and 108 chants of each planetary mantra, Invocation of major Gods and Goddesses in Kalash, Brahman Varn, Das Mahavidya yantra Pujan, Mantra Japa of each Goddess, Kavach recitation of each Goddess, Homa with 108 Ahutis to each Goddess, Yajna, Ahutis to (Navgraha, Ganesh, 64 yogini, Shetrapal, Putusukt, Devi Sukt, Rudra Sukt), Aarti and Pushpaanjali. Gayatri, the mother of Vedas, is the efficient cause of the origin of all powers of this universe. She by virtue of her divinity makes them supernatural that is why she is called Savita. Gayatri is not an independent God or Goddess. It is a manifestation of Omnipotent God. Brahma is invariable, incomprehensible and is beyond intellect. In this Idol, Gayatri ji is exquisitely portrayed in heavy shining brass. The Shivalingam denotes the primeval energy of the Creator. 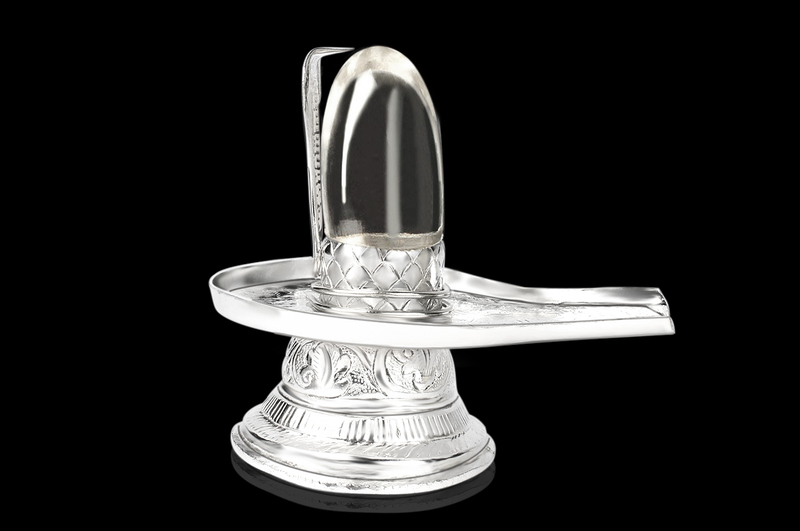 It is believed that at the end of all creation, during the great deluge, all of the different aspects of God find a resting place in the Lingam; Brahma is absorbed into the right, Vishnu to the left and Gayatri into the heart.A gemstone shivling is considered highly auspicious and is said to have one of the highest frequency vibration rate. Amethyst is a stone of spirituality and contentment. It has the ability to absorb negative energy while emitting positive energy. It is considered a stone of wisdom as it increases ones psychic awareness. Shiva is "The Auspicious One". Shiva lingam is the holy symbol of union of Lord Shiva and Shakti. Lord Shiva from time immemorial has been worshiped in the form of linga or lingam. The word linga means symbol or sign. It is the visible symbol of Nirguna Brahman (the Supreme Being) and is present in all the living beings. The most common use of the Shiva Lingam is for sacred bathing (abhishekam) and so the worship of a Shiva Lingam always includes an abhisheka usually of milk and water, but commonly with other liquids, including yogurt, honey and clarified butter as well. The word lingam is derived from the two Sanskrit words laya (dissolution) and agaman (recreation). Thus the lingam symbolizes both the creative and destructive power of the Lord and great sanctity is attached to it by the devotees. Shivlinga is worshipped in homes and temples. At home it blesses with unity and harmony in the family and guides its devotees to spiritual path. •	It is installed with Yoni facing North direction and west face of Lingam towards you. •	Sphatik lingam may be worshipped by everyone. •	Worshipping of Lingam blesses the family of the devotee with Unity, harmony, spiritual upliftment and prosperity. 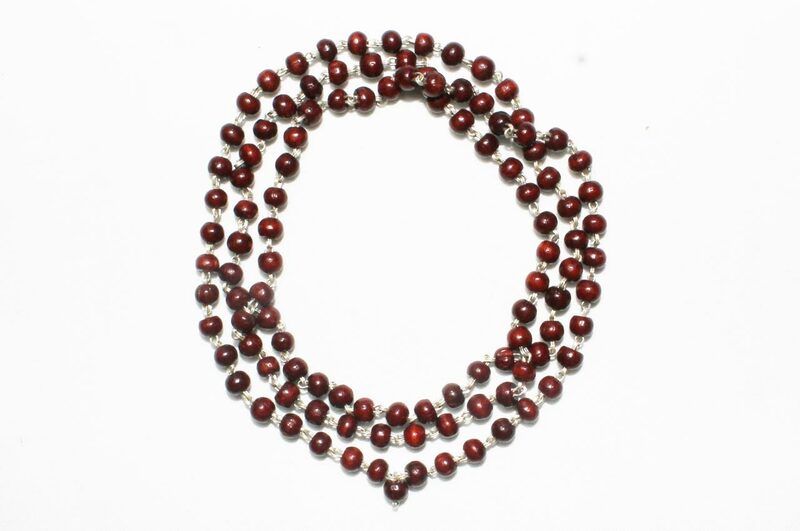 The Rosary is made of round beads made from sacred Tulsi wood knotted with thread. Wearing Tulsi Rosary regularly would provide mental peace and purify body. Tulsi holds high reverence for Lord Vishnu, Krishna and Ram devotees, as it helps grow in spiritual path. Tulsi wood has ability to destroy bacteria, cure high fever and throat diseases. •	Wearing a Tulsi necklace is believed to have a very calming effect on your mind and temperament. It soothes the mind and fills your heart with peace. •	It is believed that the mala protects you from bad dreams, accidents, and attacks from your enemies. •	It negates all your past sins and bad deeds and cleanses you from within. •	As per the Garuda Purana, anyone who wears a Tulsi mala surely benefits from pitr or devata pujas, punya karmas. The book covers five sections on the central teachings of Patanjali addressing concerns pertaining to the mind and body. Each sutra beautifully explains the yoga philosophy of the asanas with practical examples that can be applied in the fabric of our lives. From emotional afflictions and preservation of energy to optimal focus for heart-mind balance, the book is meticulously researched to broaden our understanding of the yoga philosophy. 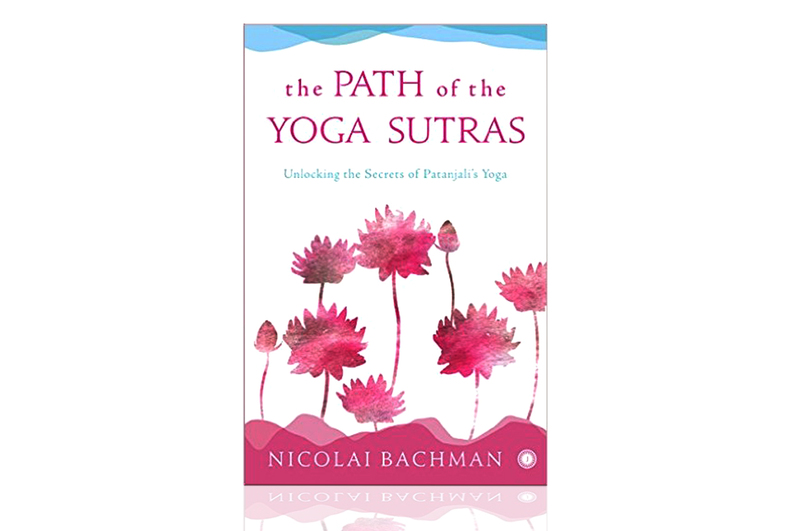 Bachman enlightens us on the ancient knowledge of Patanjali with contemporary wisdom and depth for lay readers as well as yoga practitioners. The Path of the Yoga Sutras is for anyone who believes in integrating yogic philosophy with practice for a holistic life experience. Cap made of clear quartz Sphatik beads of size 8mm which are woven together in white cotton thread and interlaced at the top with 5 parad beads and a 9 mukhi Rudraksha bead. This cap channels white light into the crown chakra and is an excellent aid in meditation and alignment with Universal consciousness. Parad beads cleanse the Citta and 9 mukhi connect one to the divine consciousness. Usage: Wear during meditation time for a minimum period of 45 minutes. This beautiful Rudraksha dress is developed using references from Shiv Purana which state about wearing different number of Rudraksha on different parts of the body to attain Rudrahood. A complete dress for wearing during Meditation made with 5 mukhi Rudraksha beads of size 9mm . •	3 strands of 120 Rudraksha each, to be worn across the chest as Yagyopaveet. This hand woven mat of Kusha grass is used as a ritual seat and finds mention in as far back as the Vedas, and the Bhagavad Gita (ch. 6). Kusha grass is considered purifying, and rings woven of it are sometimes worn in worship to keep the hands ritually pure. It is also a remarkable insulator, both physically and metaphysically and hence most suitable for meditation and japa. Religious texts state that by doing Japa without sitting on an Asana (a seat), one attains no fruit. Hessonite (Gomed) is the gemstone of planet Rahu and helps the wearer attain speedy success, wealth, happiness and helps them win over others. Hessonite gemstone is governed by the planet Rahu. Individuals with Rahu placed poorly in their Natal charts face delays in their marriages, face marital discords, face mental instability, develop harsh speech, indulge in gambling and delays in professional progress. Hessonite gemstone pacifies the malefic effects of planet Rahu and the person attains the fulfillment of his desires and ambitions. •	It cures cerebral disorders. Planet Rahu is said to affect Sahashara Chakra aka Crown Chakra. 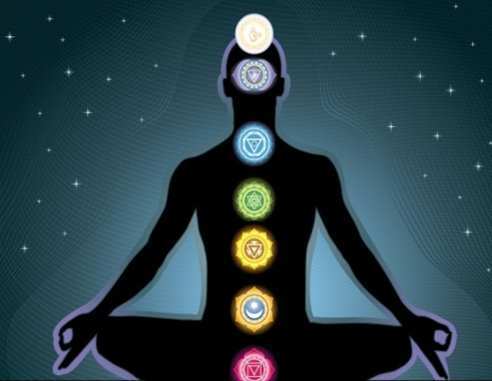 Vedic scriptures mention that the human body works in accordance with seven energy centres called Charkas (Click here to know about the Chakras in details). The Crown Chakra located on the top of the body is known for aligning our inner self with the Universal Being or Supereme Consciousness, teaching us to develop gratitude for everything and everything that surrounds us. When the Crown Chakra is blocked, the person faces depression, isolation, develops obsessive thinking and runs into a lot of confusions. Hessonite gemstone re-energizes the Crown Chakra and the person learns to express gratitude and satisfaction as well as develops positive outlook in life. Any gemstone must be in their natural state meaning it should not be subjected to heat treatment. Generally stones are heated to enhance their color quality. However, heating the stones minimizes their inner value and quality. Untreated gemstones are naturally authentic and tend to generate better results. Since Hessonite gemstone goes through a number of hands, it may contain negative energies. It is best to detoxify by putting it in pure water overnight. DO NOT use vinegar of any sort to clean it else it will corrode. 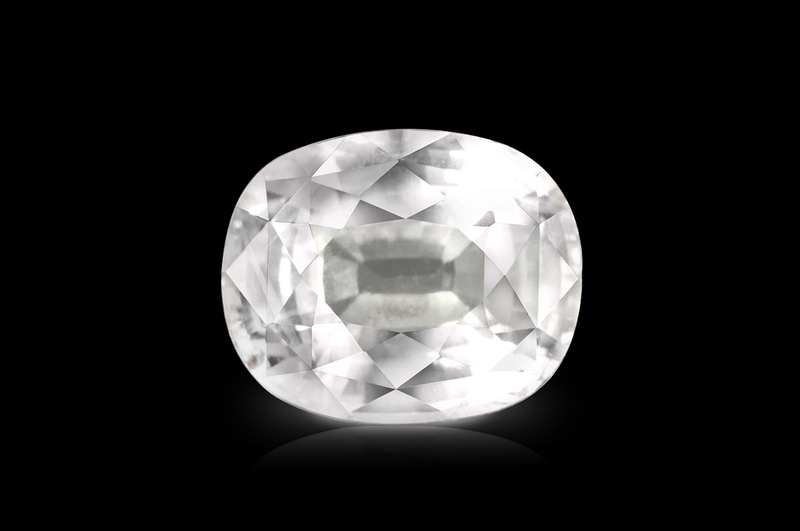 Natural White Sapphire gemstone is associated with Planet Uranus and is ruled by Lord Shiva. Astrologically, Uranus blesses with good luck, wealth and luxury. Lord Shiva is the bestower of desire fulfillments and liberation from karmic reactions. White Sapphire is the gem of Lord Shiva who is the ruling deity of Sahashara Chakra, one of the subtle energy centers located atop the head. It channels copious amount of healing white light into the body. Once worn, the gemstone energizes your Sahashara Chakra that connects you with the universe by tuning you to the highest form of consciousness and the divine, making you abundant, grateful and contended. As a ring on right hand Index finger or as a bracelet. Siddha Parad Gutika in silver is made from a pure Parad bead capped in pure silver and strung by a silk thread to be worn close to the throat. Siddh Parad Gutika is worn for peace, prosperity, health and spiritual growth. Siddha Parad Gutika in silver is prepared by Vaidya Shree Pundit Deenanath of Jaipur. •	Parad works on the Sahasrara Chakra. •	Parad enhances the association with Lord Shiva and benefits in meditation and spiritual routine. 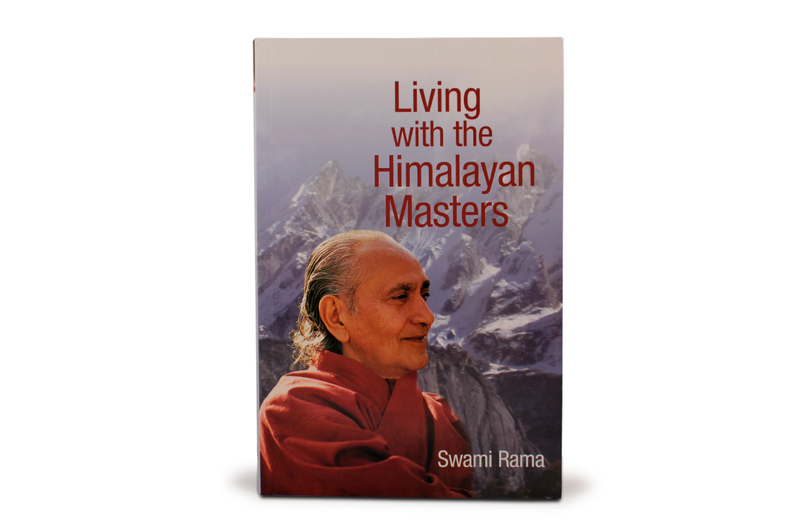 •	Brings peace, contentment, concentration, dhyana and supports in Samadhi. •	Siddh Parad when prepared as per ancient knowledge of Parad Bandhan contains miraculous properties of healing and protection. Parad Bead (Siddh Gutika) are Complete with 8 Samkaras: Complete with 8 Samskaras i.e. 8 stages of Purification are completed as per Parad Sanmhita and a thorough medicated and hygienic removal of Saptakanchuki is done. The Siddha Parad (Mercury mouth closed with Aghor Vidhya) is formed to make Murthi - Badhha/Agnibadha (heat sustaining) Parad Gutika. The Gutika gives 24 Ras and 5 Tatva which removes all diseases from the body. One can choose the Pure Siddha Parad Gutika either with or without silver coating. The gutika without the silver coating works faster where as the one with silver coating looks more beautiful. Please specify on checkout. Parad used in this Shivalinga is prepared by Vaidya Shree Pundit Deenanath of Jaipur which is complete with 8 Sanskaars (8 stage of Purifications done as per Parad Sanmhita) and removal of Saptakanchuki(100 % medicated and hygienic); the Siddha Parad(Mercury mouth closed with Aghor Vidhya) is formed to make Murthi-Badhha/Agnibadha (sustain the heat) Shiva lingam. The Extract from this Shivling gives 24 Ras and 5 Tatva which removes all diseases in the body. It is Parad Shivling which is capable of giving instant Luck, wealth, position, name and fame. The presence of which in the House is itself a complete life. Shiva lingam is the holy symbol of union of Lord Shiva and Shakti. Shivalingam is worshipped in homes and temples. At home it blesses with unity and harmony in the family and guides its devotees to spiritual path. We at Rudra Centre offer over fourteen auspicious combinations of Rudraksha beads and gemstones under Rudraksha Ratna Science Therapy (RRST®) for higher spiritual progress. The RRST® is a scientific method devised by Neeta Singhal to string Rudraksha and Gems in a manner that increases your spiritual sense. These RRST combinations are designed after extensive research, using knowledge from the Vedas and Puranas. 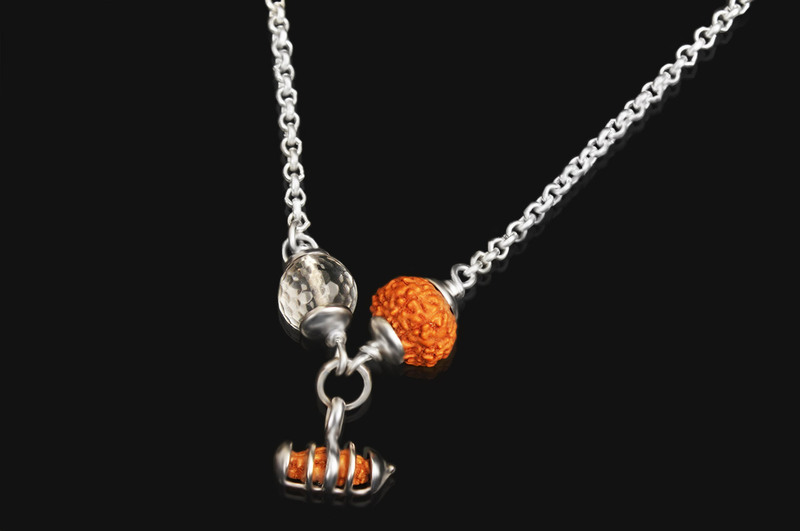 Combinations like the Shiv Netra mala help activate the Sahasrara Chakra, while others such as the Shiva Shakti pendant help open up the Hrit Padma Chakra. The Hrit Padma chakra is the spiritual heart which is the abode of Goddess Mahalaxmi. It is variously described as a lotus with 8, 16, or 1000 petals, being golden, red, or white of colour; inside of the lotus there are circular regions of sun, moon, and fire and in the centre of the Chakra, there are a whishing-tree (kalpavriksha), a throne consisting of Matrika letters (symbolizing the spiritual heart of the aspirant) on which he/she should place his or her Ishtadevata in meditation, and an altar. Once opened, it attracts peace, harmony and abundance in the wearer’s life.